March | 2010 | Azazel's Bitz Box. Not to mince too many words. Since the last post I stopped painting , and only recently started again. Here’s some WIP stuff from the painting desk from the last month and a bit. The next update will have some finished stuff. The Mouth of Sauron. Foot is nearing completion here, while Mounted is still to have his arm pinned. 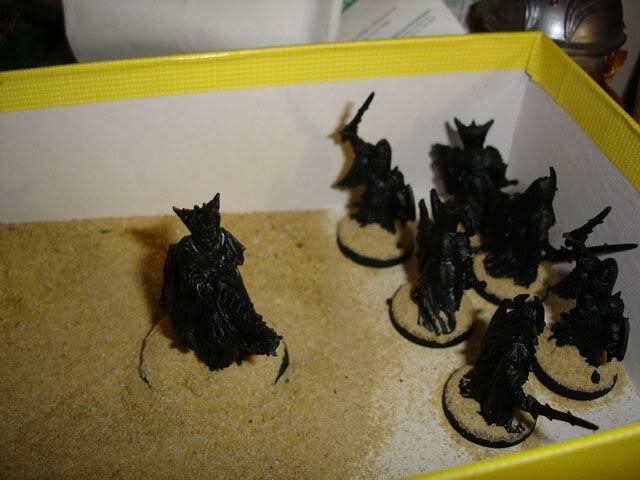 After assembly and spraying is completed, the mouth of Sauron takes a dip into the Sandbox, along with some Black Numenorian infantry. I just recieved my second batch of Black Numenorian cavalry a couple of days ago, so once I assemble the 10 horsemen to my satisfaction, I’ll start painting them up along with the Mounted version of the Mouth, so he can lead them into battle! 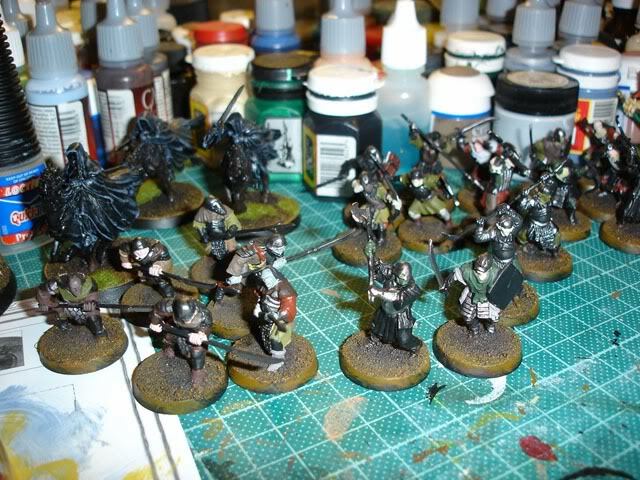 At some stage I’ll get further onto the Numenorian Infantry, as well. 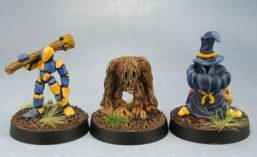 Painting guys in dirty black robes with rusty armour is already starting to wear thin, though.. Some Orcs. Since they’re basically low-detail Plastic figures which you field in hordes I’m not going to put any significant effort into them. 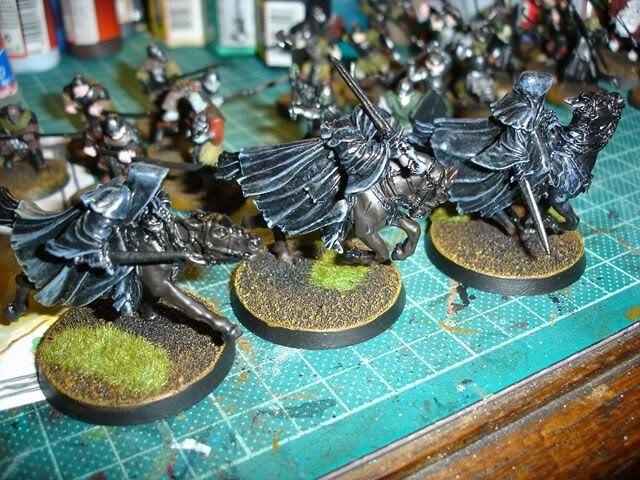 Also some Black Riders on the edge of the pic. 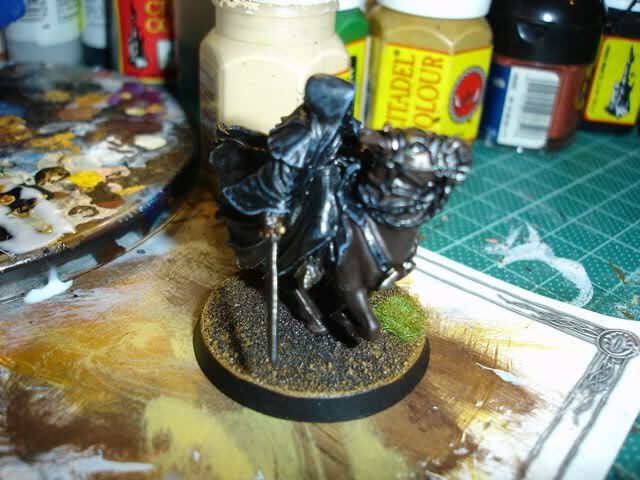 My first three Black Riders in the Latter WIP stages. I’ve since finished these, and picked up 2 more. Should have 3 more in another week or so, plus the mounted Witch-King model I finally assembled recently will give me Nine as depicted in the films and pretty much everywhere. 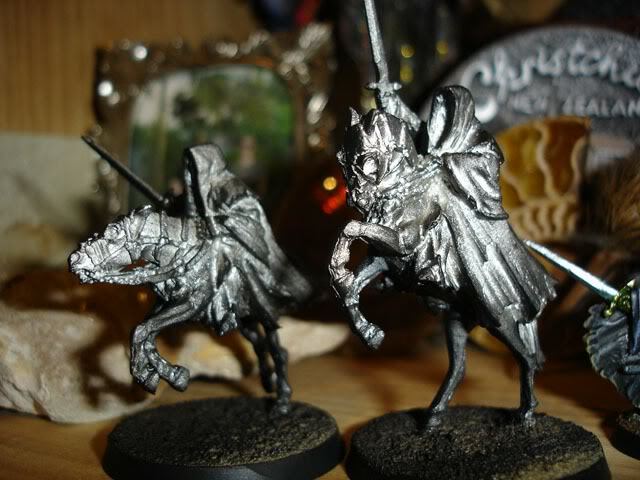 I’ve also got most of the GW-created versions and the Witch-King wearing his Iron Crown on horse, but I’ve always wanted to get the nine of the “classic” Riders. A little later on. This one of the Rider figures combined with that particular sword arm is my favorite. I think it has lots of character, and a nice sense of menace. 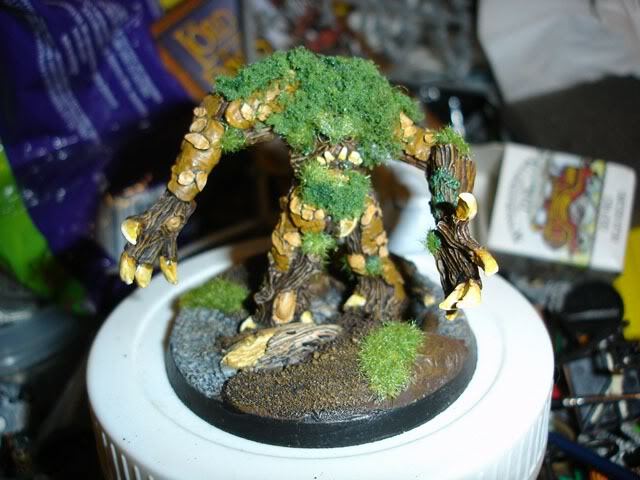 A GW Warhammer Treeman. I always liked this model (and the other one, with the skully face). I finally finished this one during my last painting phase when I did the Orc featured in the first posts, but never photographed it until now. It makes a fine enough Ent, since they come in all shapes and sizes. I wonder if I have skully-face lost in one of my minis boxes.. ? 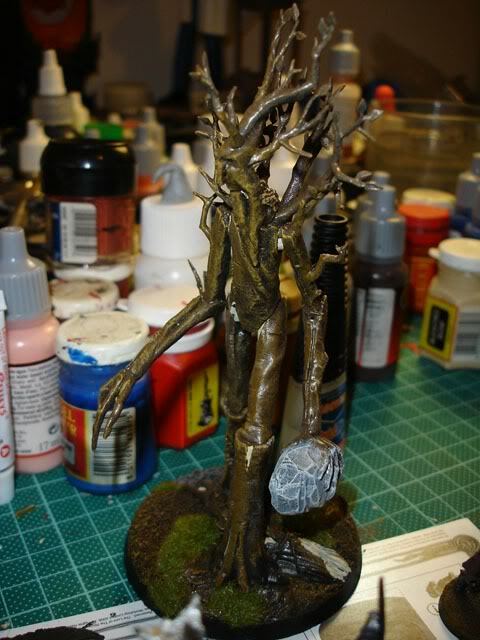 The new LOTR plastic Treeman, at WIP stage. This is why I got the older WFB one out. This guy has since been finished, and while everyone else I’ve shown it to seems to think it’s good, I’m still not happy with how it turned out. I’ll get some pics of the finished version up at some stage. Gandalf at Khazad-Dum. I still haven’t even assembled the Balrog, since the damned thing was badly warped when I got around to it. I should have checked it out sooner and forced GW to give me a refund. Can’t really do that when you try to assemble it several years after buying it. 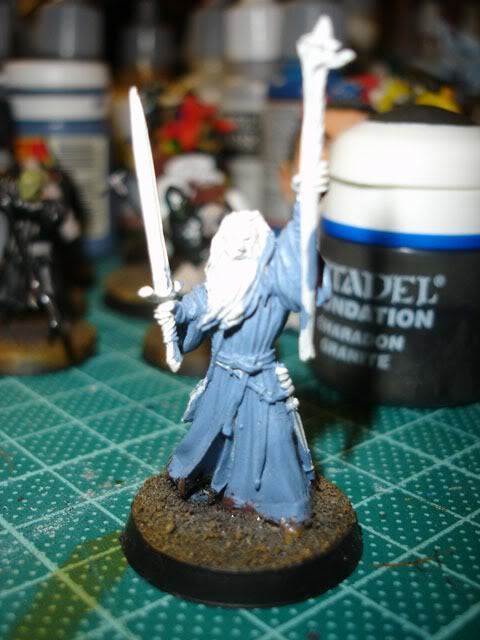 I prefer using the dark blue-grey for Gandalf, rather than the film-accurate dull, dirty grey. 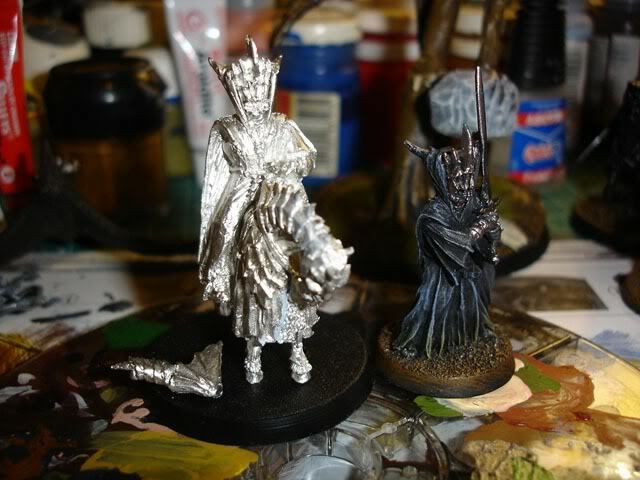 After all, if everything was film-accurate, a good half of the miniatures would essentially be shades of dirty grey.